Trying to figure out the terms and expressions of data centers can be challenging. 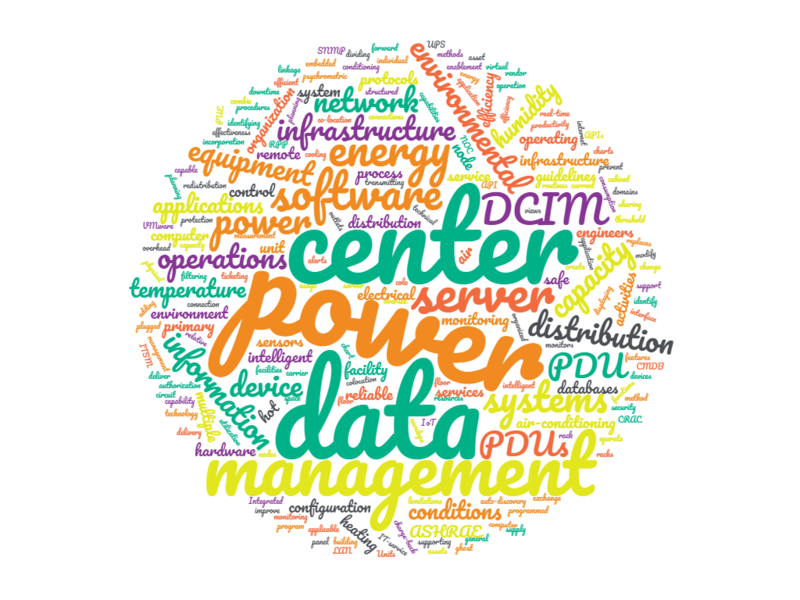 Luckily we have defined some of the most used vocabulary that one will stumble upon when researching and learning about data center management and DCIM. 2. American Society of Heating, Refrigerating & Air-Conditioning Engineers (ASHRAE). Sets guidelines as to environmental and humidity, temperature and moisture for safe cooling and operation of your data center. 3. Auto-discovery. The process of automatically searching and identifying data center assets, IT and facility infrastructure, and their associated asset information, via standards-based protocols over a network. 4. Branch Circuit Monitoring (BCM). Provides real-time views of electrical capacity and power usage at the panelboard (mains), floor PDU, Remote power panel (RPP) or overhead busway. It sends threshold alerts for power and environmental conditions, thereby helping to prevent downtime. The data can also support energy efficiency and customer charge-back initiatives. 5. Colocation, co-location, or colo. A data center or "carrier hotel" where equipment, space, and bandwidth are available for rental to retail customers. 6. Computer Room Air Conditioning (CRAC) unit. A device that monitors and maintains the temperature, air distribution and humidity in a data center. 7. Data Center Energy Productivity (DCeP). An equation that quantifies useful work that a data center produces based on the amount of energy it consumes. DCeP is computed as useful work produced divided by total energy consumed by the data center. DCeP allows each user to define useful work as applicable to the user's business. 8. Data Center Infrastructure Efficiency (DCIE). A performance improvement metric used to calculate the energy efficiency of a data center. DCIE is the percentage value derived, by dividing information technology equipment power by total facility power. 9. Data center infrastructure management (DCIM). DCIM software is a new class of software that gives data center operators the ability to run efficient data center operations and improve data center infrastructure planning and design. It typically replaces Excel, Visio, and home grown databases. DCIM software can bridge information across organizational domains – Data Center Ops, Facilities, and IT to maximize utilization of the data center. 10. Data Center Management. The role of individuals (data center managers) tasked within a data center to oversee technical and IT issues. This includes management of computer and server operations, large amounts of data, services and applications, and the protection and security of the data. 11. Disaggregated systems. The use of an opened hardware environment with shared connections and power feeds. Each piece can be purchased independently of the others. 12. Floor (-mounted) PDUs. Sometimes called a main distribution unit (MDU), provides an important management bridge between a building's primary power and various equipment racks within a data center or network operations center (NOC). 13. Hot Spots. Data center hot spots refer to server input air conditions that are either too hot or too dry, according to the American Society of Heating, Refrigerating and Air-Conditioning Engineers (ASHRAE) TC 9.9 guidelines. 14. Integrated systems. The combination of multiple functions and linkage of multiple vendor systems in such a way as to work as a single, unified entity. 15. The Internet of Things (IoT). The concept of physical objects or things embedded within the network that are self-aware and that enable the exchange of data with other devices and applications. 16. "Intelligent Capacity Planning". The activities used to keep operations running smoothly by helping prepare for the future. Identify actions according to data center needs by understanding capacity limitations, getting the most out of current capacity and adding capacity in a deliberate way. 17. Intelligent PDU. The former provides basic, but reliable power distribution, while the latter PDUs that provide additional features beyond basic, reliable distribution. Features include power metering, environmental monitoring and remote outlets. 18. IT-service continuity. The incorporation of methods, such as disaster recovery management, to reduce and minimize the impact of disruption and incidents on IT service delivery to customers. 19. IT service management (ITSM). The entirety of activities – directed by policies, organized and structured in processes and supporting procedures – that are performed by an organization or part of an organization to plan, deliver, operate and control IT services offered to customers. 20. Nodes. In a network, a node is a connection point, either a redistribution point or an end point for data transmissions. In general, a node has programmed or engineered capability to recognize and process or forward transmissions to other nodes. 21. Power Distribution Unit (PDU). A device for controlling electrical power in a data center. PDUs are classified based on functionalities, including power filtering, remote monitoring, control by LAN or SNMP, and intelligent load balancing. 23. Psychrometric Charts. A system and method of displaying the temperature and relative humidity data of sensors. Used to compare the data of the sensors to the environmental envelope of the psychrometric chart, in order to ensure safe operating conditions for data center equipment. 25. Rack Power Distribution Units (PDUs). A device or server that is capable of being mounted in a rack or a cabinet. In a data center environment, a rack PDU is used to supply power to a server rack. 26. Role based Access. Enablement access to user capabilities and tasks based on authorization and responsibilities. For example, in DCIM software, access is the ability of an individual user to perform a specific task, such as view, create, or modify a file. 27. Software-defined (SDN) Infrastructure. The ability to define application requirements and automate the manual tasks associated with creating the resultant infrastructure configuration from a single place. 28. UPS (Uninterruptible Power Supply). A device that allows a computer to keep running when the primary power source is lost. It can also protect against power surges. 29. Virtual server. A server that shares hardware and software resources with other operating systems. VMware is one such brand. 30. Zombie Server (comatose or ghost server). Is one that is plugged in and drawing power but not performing any work and possibly not detectable other than physically. For more information about what is new in DCIM click here!